The “authors’ version” of the survey, that is, the version of the survey that has not had a special treatment by the publisher’s production department, will be available soon at the URL listed above. We will be using the survey during our forthcoming tutorial on, indeed, click models for web search, at SIGIR 2015. With the rapid growth of web search in recent years, the problem of modeling its users has started to attract more and more attention of the information retrieval community. This has several motivations. By building a model of user behavior we are essentially developing a better understanding of a user, which ultimately helps us to deliver a better search experience. A model of user behavior can also be used as a predictive device for non-observed items such as document relevance, which makes it useful for improving search result ranking. Finally, in many situations experimenting with real users is just infeasible and hence user simulations based on accurate models play an essential role in understanding the implications of algorithmic changes to search engine results or presentation changes to the search engine result page. 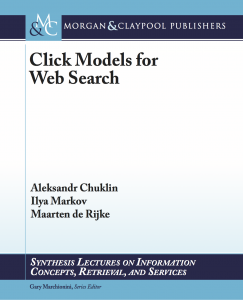 In this survey we summarize advances in modeling user click behavior on a web search engine result page. We present simple click models as well as more complex models aimed at capturing non-trivial user behavior patterns on modern search engine result pages. We discuss how these models compare to each other, what challenges they have, and what ways there are to address these challenges. 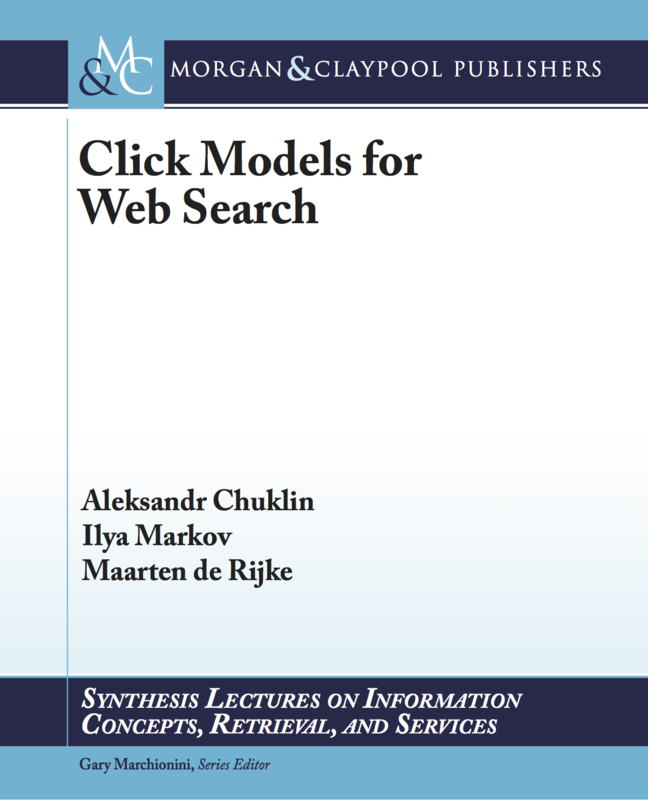 We also study the problem of evaluating click models and discuss the main applications of click models. Click models have become an essential tool for understanding user behavior on a search engine result page, running simulated experiments and predicting relevance. Dozens of click models have been proposed, all aiming to tackle problems stemming from the complexity of user behavior or of contemporary result pages. Many models have been evaluated using proprietary data, hence the results are hard to reproduce. The choice of baseline models is not always motivated and the fairness of such comparisons may be questioned. In this study, we perform a detailed analysis of all major click models for web search ranging from very simplistic to very complex. We employ a publicly available dataset, open-source software and a range of evaluation techniques, which makes our results both representative and reproducible. We also analyze the query space to show what type of queries each model can handle best.